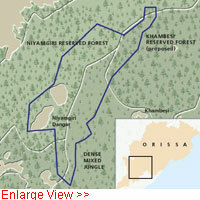 Niyamgiri hills comprise a 250-sq km massif of hill forests spread across Kalahandi, Rayagada and Koraput districts. A proposal is pending with the Kalahandi forest division's working plan (approved by MoEF in 1998) to notify the area as a wildlife sanctuary. The area was also listed as a proposed elephant reserve by the state in August 2004. VAL's proposed mining area is situated within the Niyamgiri Reserve Forest of Kalahandi and Khambesi and Niyamgiri proposed reserve forest and jungle block (protected forest) of Rayagada forest division. According to CEC and WII, the hills are the source of the Vamsadhara river and a major tributary of the Nagvalli river. Both rivers supply water to several districts of southern Orissa and Andhra Pradesh. Thirty-six perennial streams originating around the mining lease site provide drinking water and water to irrigate fields in the adjoining villages. The Environmental Protection Group, Orissa, says, the dense forests on the hills shelter elephants, sambars, leopards, tigers, barking deers, giant squirrels, various birds species and have more than 300 varieties of plants and trees, including about 50 kinds of medicinal plants. Many of these animals and at least four of the plants found here are listed in IUCN's Red Data Book of endangered species, it says. The project's EIA report by Tata AIG consultants agrees in part. It says, "The area exhibits a well-balanced ecosystem with a poised prey-predator relationship." But it goes on to add that though "the secondary data identifies a variety of faunal species under categories like endangered and vulnerable as per the Zoological Survey of India's Red Data… primary survey does not show all of the mammalian species listed". The report also describes the actual mining area on the plateau, which is open grassland, as not useful for wildlife and forests. However, the first WII report counters this. It notes, "These plateaus are very productive with high occurrence of several herbivore and carnivore species." Even as the presence of wildlife was being debated in Delhi's apex court, DTE secured clinching evidence of the area's wildlife. On May 17, our photojournalist captured a fullgrown leopard on camera as it silently walked across the open grassland of Niyamgiri. So, will mining on the hills cause irreparable harm to wildlife? The state government does not think so. Suresh Mohanty, Orissa's principal chief conservator of forests (wildlife), told DTE: "Lanjigarh forest belt is over 20,000 ha and "even if 600 or 700 ha of this is lost, animals will switch over to newer habitats. Animals can also adjust to certain interventions." He added, "Human usage and development proposals can't be wished away, so wildlife has to adjust to fulfil these requirements." But the value of forest is not just as habitat for wildlife but also as a catchment for water. There is again a dispute on this. The Orissa government and Vedanta claim that since all the water bodies originate much below the mining site, their flow wouldn't be affected. 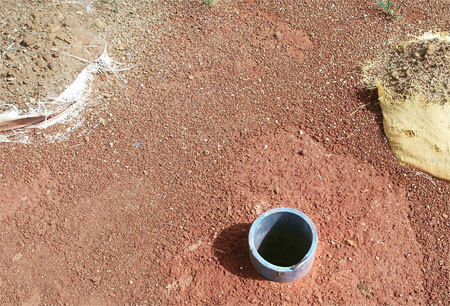 But environmentalists and WII say that mining will impact the water flow of the region because bauxite deposits, which are by nature porous, act as overhead aquifers. They recharge zones and improve subsurface flows, which in turn feed rivers through the year, especially during the lean season. Without the deposits, the rivers will dry up in the summer. Activists allege that the hills are "a single-hill country" for the Dongria Kondhs, who have "nurtured their life and livelihood patterns around forest and wildlife forming a formidable system of mutual dependence" and are largely responsible for maintaining the dense forest cover on Niyamgiri. They believe that mining Niyamgiri and its adjacent hill ranges "will cause the cultural and social extinction of one of the most culturally unique primitive tribes of the country". Their numbers are fast dwindling— according to the 2001 census the current population of the Dongrias is less than 8,000. The state government, however, says "the mining activities will not affect Dongria's livelihood, custom, practices and their lifestyle, because they don't live there". In Lanjigarh, the Dongria Kondhs and rest of the tribal villages aren't buying that argument. They believe the hill is the abode of the Niyam Raja and have made a promise to him. "Before Niyamgiri is killed, we will die," Khumti Majhi told DTE. "Dongrias have been living here for generations. Niyamgiri gives us vegetables, herbs, fruits and roots, it gives us food, water, this breeze, these trees, everything, for free. Can the sarkar put all this back once it's gone?"